Nowadays, starting a blog is no longer a hobby, but a job opportunity for many professionals and a key requirement for companies who want to get more visibility on the web. How many of you would like to become famous bloggers, achieving authority and economic success through working online? 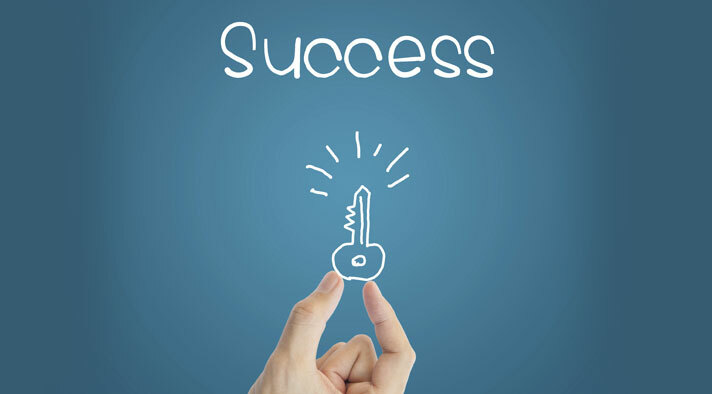 Surely many, but to accomplish your dream you have to follow the right strategies. In this post, you can read 12 steps needed to create a successful blog. The first step ever to creating a successful blog is to find the topic you will cover. In other words, you have to decide what to talk about on your blog. From vegan recipes to tourist destinations, from sports to online trading: you should identify a niche not yet inflated, in which you can grow and achieve success. It must be a niche you’re passionate about, for which you have a genuine interest. Choose a field in which you can consider yourself an expert, and you’ve developed enough experience to add value to your blog. Each website serves a target audience, then select a topic that is useful to a large number of people. If you want to create a successful blog, you must think about different monetization strategies. Let’s start with selecting five possible niches. Now you have 5 candidates for the topic of your blog, but how can you choose one? First, putting the niches under the microscope. Which means, you have to analyze each niche and understand what is the hidden potential. Search for related content and analyze the existing competition. This is the best way to get an idea of what content you may publish and if there is enough room for you, with a margin for improvement through which you can beat your competitors. BuzzSumo is a great tool to analyze what content performs best for any topic or competitor. Choosing the right keywords means to get visibility on search engines. In other words, an essential aspect for your blog. Use Google AdWords and Google Trends to seek the most important keywords for each of your niches. While doing so, also check for those used by competing sites (those that appear at the top in a SERP). You’re finally there: it’s time to crown the winner. What is the niche that has passed with flying colors the tests? On the highest step of the podium, there’s must be the topic that is more rich in content and ideas, more versatile and more inclined to be monetized, the adequate audience. Choose carefully, because around this niche it will turn all your activity. Have you already thought about how to call your blog? Now is the time to do it. The name is a very important business card, which works as a catalyst for users interested in your topic. For this, make sure it is as short as possible, easy to remember, read and pronounce, and appealing to your target. Try to be smart with your choice and opt for a name that is able to make people understand who you are without being cryptic, but at the same time arouse interest and curiosity. In short, a clear name but with personality. I use GoDaddy for searching and choosing my domain names. There are several good hosting services available out there. Be sure to choose one that has a good reputation with excellent support. Suggestion: I use HostGator. I’ve a dedicated server, with 99,9% uptime in the last months. But you can opt for a cheaper plan, like the Hatchling, starting at $3,45/mo. One of the most important features of WordPress is precisely the choice of themes. They come in all types, free or paid. 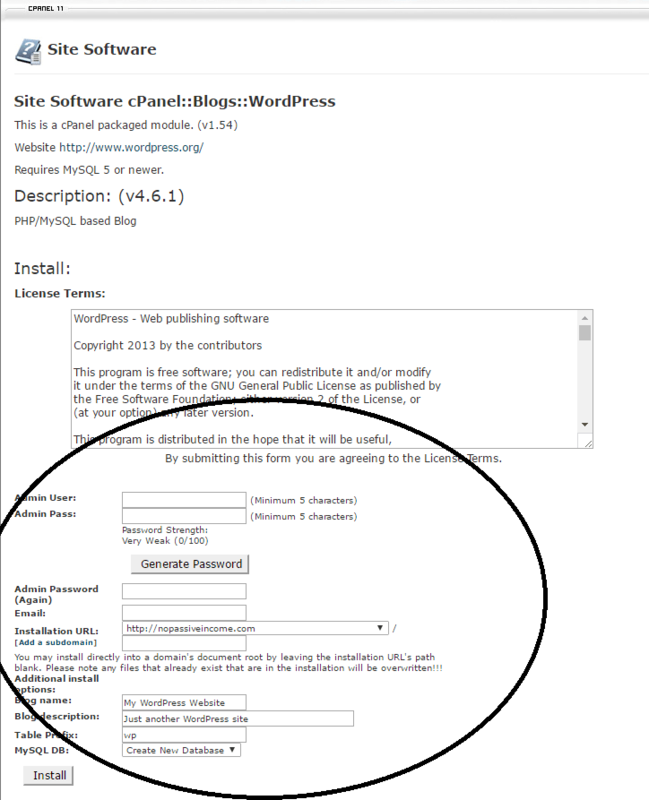 Once installed, you will get the WordPress default theme (depending on the CMS version), but you can easily change it to make your blog even more special. Choose a simple and intuitive theme, with an immediate and minimalist design (less is more). Also, make sure it is compatible with the latest version of WordPress. I suggest Genesis Framework, it’s versatile and easy to personalize, with a professional design. While creating content for your blog, you will need to embed images. There are several places where you can download pictures for your website. To create a blog and take it to the success it is crucial to spend time on SEO (Search Engine Optimization). On-page SEO means apply some tricks that will make your blog more visible to search engines and therefore will scale the results of the SERP (search results pages). in the alternative text of images. Also, try to use even variations of the primary keyword. These are just some suggestions, visit this page to get a complete guide on on-page SEO. Every article you are going to publish must have something useful and concrete to say, a specific goal that makes him worthy of reading. A clear body of the text, with the proper use of keywords. Some links to your other articles. Some links to relevant and good content outside your blog. Once you have published new content, it’s time to promote it. There are several ways to market your site and get new visitors. To name a few: guest blogging, blog commenting and social media marketing. I’m sure you’ve been waiting for this part with trepidation. And how to blame you? 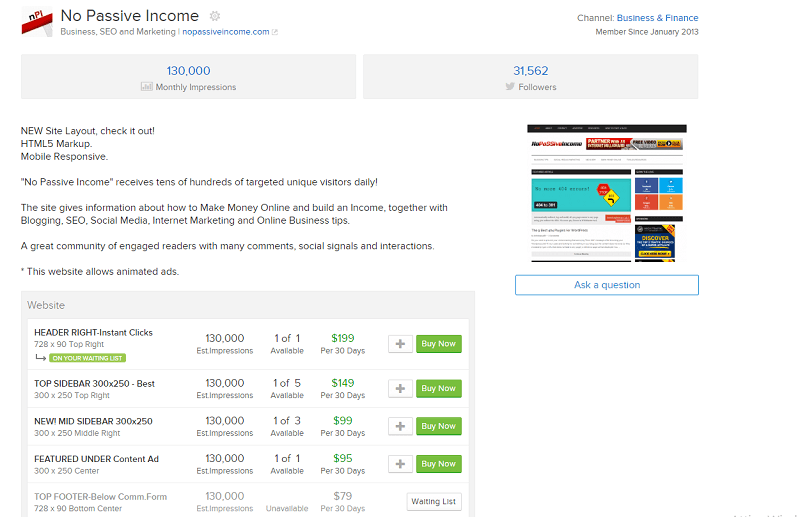 I myself have founded several blogs with the aim of turning them into a profitable business, like NoPassiveIncome, for example. You have 4 main options (at least from my point of view). You can choose one, although it is normal to combine more strategies together. This is the most popular and obvious choice. There are lots of networks that allow you to place their ads on your site and get paid (normally by the number of clicks you receive on advertising, but also based on different models, like CPM or CPA). Among these, the most widely used is Google Adsense. Other online advertising solutions include networks like BuySellAds, and alternatives like PublicityClerks. You need to register and submit your website. Once you have been approved, you will be placed on their marketplace, where you can create new ad spaces to be sold for a certain fixed monthly price or by impressions. Earning with affiliate marketing means placing links in your blog that address to the sales page of a product or service. When your visitors click that link, arrive on the page and make a purchase, you earn a commission on the sale. This option may lead to gains with several zeros, but without creating a personal brand, it’s better to opt for other routes. The advantage of this type of monetization is that you can focus on creating digital products, such as video courses or eBooks. These are relatively easy to be produced, even from home, and they can be distributed without sophisticated tools. Moreover, unlike a physical product, you create a digital product only once and then potentially your sales continue endlessly without any effort (the sale is automatic and you do not “make” new products). You can begin with a simple PDF eBook. You can offer it for free to your visitors, in exchange for their email address. Or, you can sell it for a small price, via Amazon Kindle (becoming an author), for example. Deciding to sell your services may be a good idea too. You must find something that you are really good at, and then sell your skill for a certain rate. Sponsored posts are a common way to monetize a website. Once you have created your blog and gained reputation, you can get paid to publish a post that sponsors a product or service. You can have sponsorships for different things: a post, a podcast, a video, etc. Here we are, at the end of this post, but at the beginning of your path to success. You graduated: now it’s time to become a professional blogger! Put into practice all these suggestions and try to build a profitable business. If you have any other tips, please share them by adding a comment below. Thanks and don’t forget to share the post, if you liked it! This goes to show that a successful blog never has to be overly complicated. Find a niche (preferably one that you’re passionate about) and the rest is mostly “rinse and repeat” (promotion + content + build trust). I’d also like to add that some image plugins make the process of uploading photos much easier, such as the Pixabay WordPress plugin. So once the blog is configured, it’s always great to have as much convenience as possible as a way to avoid procrastinating. Thanks for yet another detailed post, Erik..
it seems easy to build a profitable blog, isn’t it? But most of the people who try fail at it. I think, as you mentioned, it’s “just” a matter of persistance. But you should also have a plan. Because doing and repeating the same things that do not work won’t lead you anywhere. Thanks for suggesting that WP plugin. I’ll check it out. Your primary and ongoing goal should be to continuously develop innovative content and put a truly unique spin on whatever topic you’re blogging about.For a blog to be successful, you must stay on topic and cater to the wants, needs and expectations of your target audience. This means developing a thorough understanding of who your audience is, then adjusting your focus as trends and demands change over time. Once you’ve found your niche, you need to know who will be reading your stuff. Being transparent is different from being honest. You needn’t share every detail about your life just for the sake of being honest. Always be honest, and be transparent when it adds value to what you’re writing.Spend your time researching what you’re writing about. The reason we are able to use so many helpful, relevant links in our essays is because we put in the time to research our topics. You mentioned all good suggestions, Amar. I have a sentence, I keep repeating myself during my online journey. “Be real, be honest, be yourself”. So far, it worked very well. Nice share. A complete guide to create a successful blog from scratch. You have mentioned all the steps to start a blog and make it successful. Glad you enjoyed the post, Kuldeep. Thanks for this, i think creating niche websites is the best, very best means of making more money online these days. I actually purchased the longtailpro, but lost the details. 😀 However, am using Keyword revealer and Kwtools and they’re working perfectly fine for me. You can send an email to the LongTailPRO support to recover your details, Stephen. Thanks for reading the post and adding your views. When I started my blogging journey I was not aware of all these things, I just started blindly now I am aware of all these things and implementing in my new projects, this guide really helps new bloggers who want to enter into blogging. In my point of view, niche, keywords, links building is the key to success, thanks for sharing a good valuable resource, see you soon. Thanks for the positive feedback, Siddaiah. Blogging, like life, is a never ending learning path. 10 is huge. Glad you noted to both link in and out to create successful blog posts. Too many bloggers think publishing means just sharing thoughts and exiting stage left. Share thoughts, solve problems and both keep folks around – inner linking – and send folks out to value resources. Both Google and your readers will love you for your generosity. Super post dude. Thanks for confirming those points. I always appreciate your visit and comment. Have a great week there! A good and useful article, especially for beginners. But you must remember that the implementation of each of the steps requires a certain training in order to avoid errors. And most importantly, the end result will determine the traffic! In order to make money online using on this approach, you need to know exactly how to drive traffic to your website. Being able to improve conversions is much better than searching for new traffic, in my opinion. What’s your point of view on this, Nick? In my understanding, the conversion and traffic is almost linearly dependent, and this is especially true for the targeted traffic. But, you can also get the targeted traffic if you accurately guess the desire of the buyers exactly at the right moment. In this part, I agree with you – if you know how to guess (foresee) the desire of the buyers, you can get them through the appropriate content. Glad to have you helped, Sanjay. Wow! This is a great post! I found this with a Google search when I was looking for different ways of back-linking to my blog content. These are all outstanding ideas! I just went through these and implemented a handful of them and I’ve bookmarked your site for future reference. Outstanding content – Thank you! Good to hear you landed from a Google search. Thanks for the positive feedback on this post.